Earlier this summer Wendy and I took a trip up to Oxford, Ohio to visit our Alma mater and the campus that played a significant role in both of our lives. This was the first time we had been back to campus in about seven years, and the first time since I've truly begun to appreciate the historic elements of architecture that make an older area important and unique. As a result, I was finally able to enjoy and appreciate the campus, but at the same time kept shaking my head at my youthful ignorance in never fully appreciating what surrounded me on a daily basis. As two bright eyed and bushy tailed teenagers, Wendy and I began our college career in the late summer of 1996. 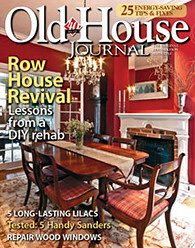 We both chose to attend Miami University in Oxford, Ohio (yes... the one in Ohio... Miami of Ohio if you must) because it had a reputation as a good school, it's a state run university (which meant tuition for in state students was lower), it was far enough from home without being too far, and it was a large school, but not too large. Besides, I had no idea what I wanted to do with my life, so a liberal arts school with a small but strong applied sciences department seemed like a good choice. Oh, and since my high school sweetheart, Wendy, decided to go there first, I was "following" her there (you don't know how many times people assume I was actually following her). From our arrival on campus on that hot August day in 1996, throughout my time walking to and from class and living in the various types of student housing, I soaked in the "college experience." I don't mean I was going wild and partying. Far from it actually. I was on my own living independently and doing things on my own schedule. I began to develop friend circles in classes and dorm life, and I was in a fraternity, which helped me develop more long-lasting friendships and taught me the value of better organization and public speaking. I was pretty solidly in my transition from teenager to adult. I just didn't really realize it at the time. The whole time we attended Miami, we were surrounded by evidence and reminders of the history that ran through the university. 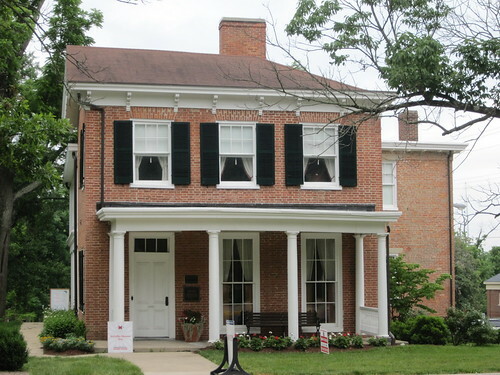 Be it the "1809 room" in the Shriver student center, aptly named to commemorate the year the university was founded, the countless plaques or signs around campus denoting the age or significance of buildings, or the general architecture of the campus and nearby houses. We may have been surrounded by all of this information, but this does not mean we really noticed it or appreciated it while it was staring us in the face. During this year's return trip we took a stroll around our favorite spots on campus. On our stroll I was walking around snapping pictures for this blog post, but also taking in what I had missed so often while walking past these very same places on the way to class. 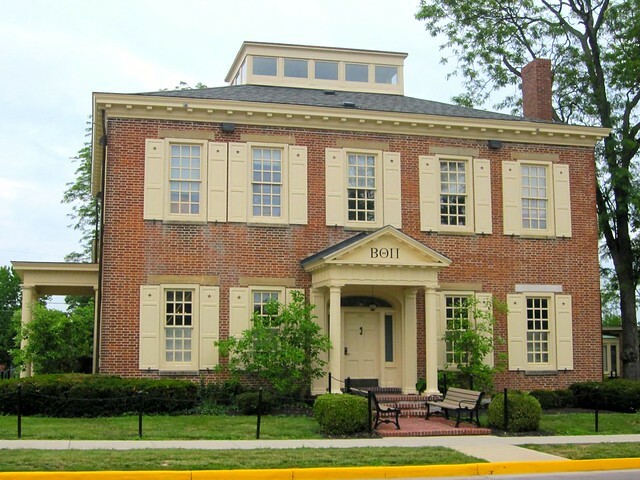 Among the various student living dorms spread all over campus, Miami is home to two dormitories that possesses the label of "oldest student housing dorms in the United States." 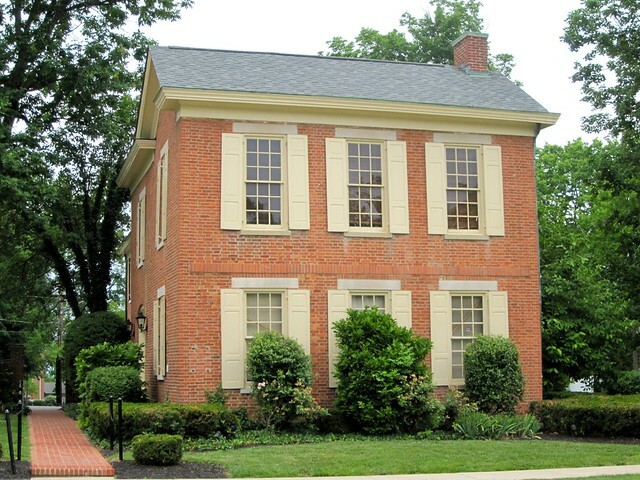 Stoddard and Elliott halls have been in continuous use for student living since they were constructed in the early 19th century. 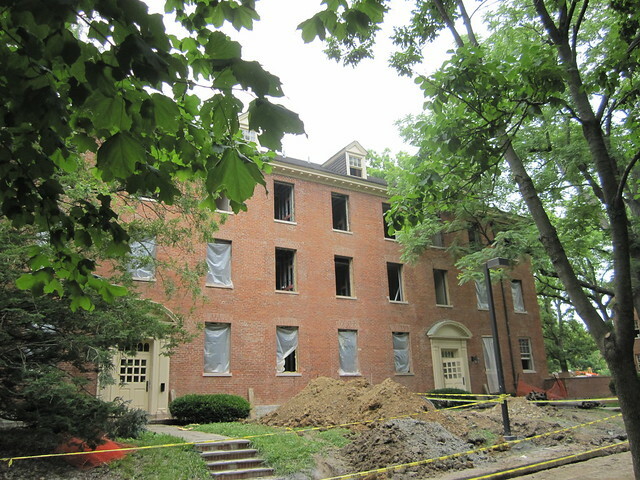 Currently, they are undergoing a massive gut renovation, which is a little sad, but I assume necessary to allow them to continue as student housing. 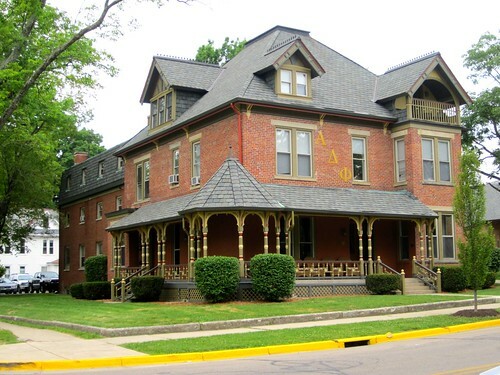 Oxford is a small college town in rural Ohio, and Miami is a university with a very prevalent greek community, so some of the coolest and biggest places are owned by fraternities. This is just a byproduct of a Greek community that has been around since the mid 1800s and was able to capitalize when real estate was quite affordable. Older buildings living life as housing for 18-22 year old guys unfortunately means that many of the places, especially on the interior, have seen better days. 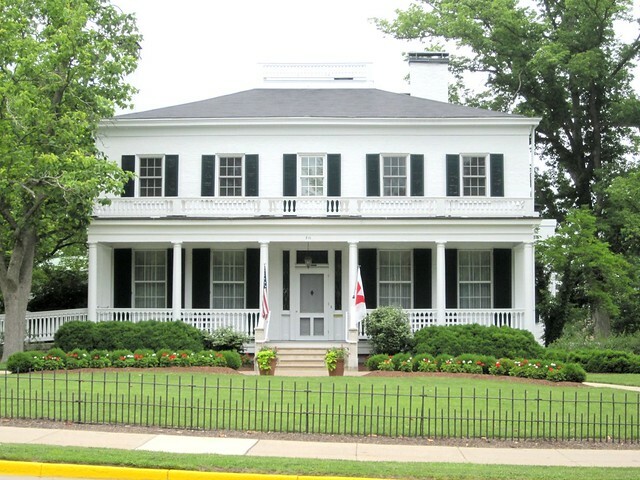 However, most tend to keep the facade of the buildings updated and appropriate to the period of the house, as is the case with the Beta house above, and the Alpha Delta Phi Victorian below. While on campus, we also took a stroll over to Miami's "Western Campus." Western, while actually on the eastern part of the school's campus, was formerly "Western College for Women" from 1855-1974. 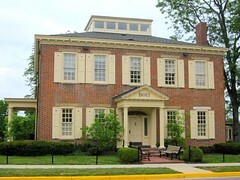 In 1974 Western became part of Miami University. Western is an extremely pretty part of Miami and we liked it so much that we selected it as the location of our wedding back in October 2002. There is a chapel on Western called Kumler Chapel. 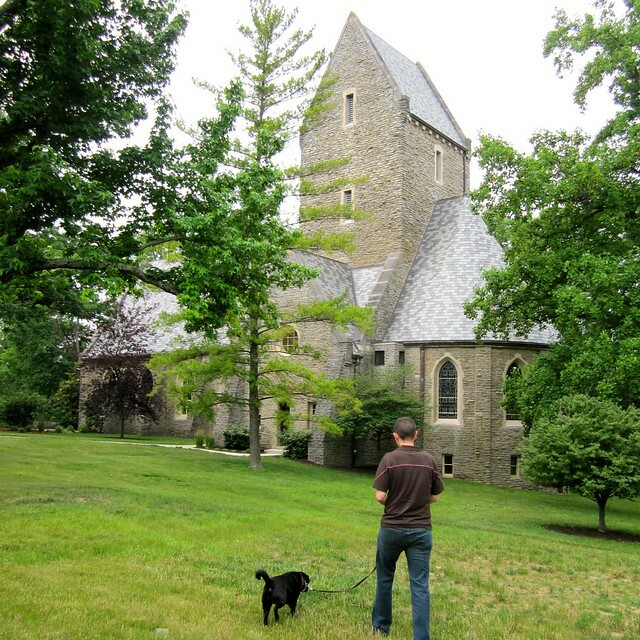 It is a large stone chapel modeled after classic Romanesque French buildings. Kumler was built over several years but completed in 1918. Wendy and I selected this chapel for our ceremony due to its peaceful setting on Miami's campus, its significance to our lives, and for how pretty the chapel itself is. Now it holds an even more special place in our hearts. This was Lulu's first time to Miami, andt I think she thoroughly enjoyed running around. One legend in Miami's massive book of lore and superstition involves a giant seal on the ground in the middle of campus. The belief is that stepping on the seal is bad luck, and if you step on the seal, you will fail your next exam. 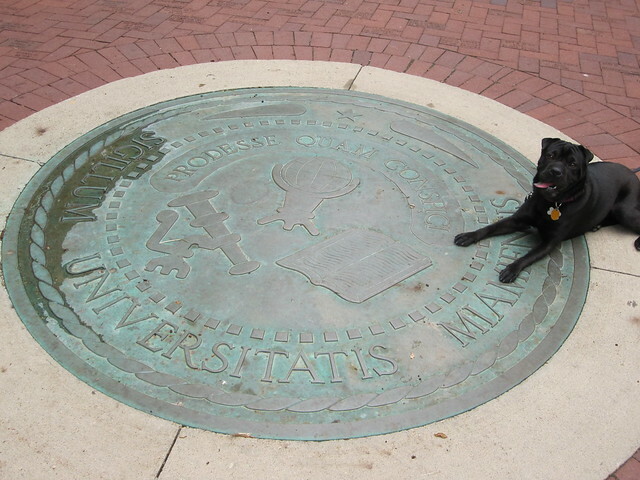 Lulu threw caution to the wind and decided to not only walk, but lay on the seal, taunting the ghosts of Miami to give her an F on her next test. We've yet to see how this works out. We're both quite glad we decided to make the trip to see the school. Having graduated more than 10 years ago, it is a little bittersweet because it reminds us how quickly life is moving. But at the same time, we really enjoyed walking back in time but a little bit, and also looking at the campus with some new-found appreciation. 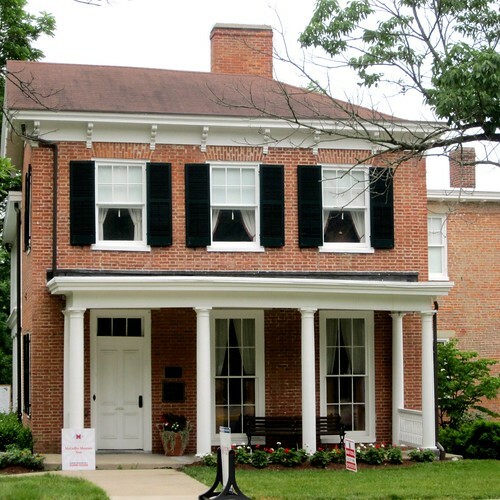 There is a saying around Miami University and among the students who've graduated. When someone not familiar says something like "Miami in Ohio? That's strange, Miami is in Florida." The response is often, "You know, Miami was a University before Florida was a state." This nod to the history of the school is something I was never able to fully appreciate while attending, but am now able to look back on and realize that this aspect of our campus life allowed me to feel more at home while attending school. Perhaps being surrounded by the interest and architecture of the university and neighborhood helped to cultivate my early appreciation for all things old. If so, it is yet another non-academic nugget I was able to take away from my four years spent at Miami University in Oxford, Ohio (yes... the Miami that is in Ohio). Perhaps you went to school on a campus that was simply full of history? There are so many all around the country, but I doubt that very few students tend to appreciate the importance of their surroundings. Did you have a similar experience in school? Maybe you actually appreciated your campus, or your campus was ultra modern and you felt out of place? Let us know a little bit of your story. The main administration building on our campus, aptly named Old Main, was just a couple blocks from my dorm. It was my Senior year before I actually stepped foot in it and and realized how gorgeous it was, both inside and out. I was running an errand for a work study job at the time, but if it weren't for that circumstance, I would have graduated without ever seeing it. Wikipedia tells me that it was built in 1863, but renovated in 1930 due to structural problems. It's amazing how many times I felt like I was on autopilot around school. Looking back, I missed out on a lot because of it. Also, it looks like the really old dorms that are now gutted at Miami were also significantly renovated in the 1930s. The University of Guelph (in Ontario, Canada), where I graduated from in 2008, began in 1874 as the Ontario School of Agriculture. In 1880, it was renamed the Ontario Agricultural College and Experimental Farm. In 1903, the MacDonald Institute joined in on the fun, and in 1922, the Ontario Veterinary College. It wasn't until 1964 that it became a recognized university. The trip back to wander around and appreciate the school was one of our main reasons for going back. That and stopping at Bagel & Deli to each some heartburn inducing food of our youth. makes me miss Miami even more. i loved the architecture and campus so much while we were there that i had withdrawal when we graduated. i still think very often and feel a connection after all these years. Thanks for sharing your visit to Miami University. My late father attended there for two years. Then his family moved to California and he had to stay out of school two years to work, and later finished college at UCLA. (This was all pre-WWII, WAY before your time!) He loved Miami and was active in a fraternity (Dekes?) there. It was nice to learn about the school from someone who knows it well. Very cool. I knew several Dekes, and as far as I know, they are still on campus (we drove by their house actually). His picture is probably still on the wall in their house, I'm pretty sure they are one of the houses that keep all of the old class photos on the walls. Miami took over Western in 1974, not 1947. I was a freshman in 74 and considered Western but instead opted for the main campus. Thanks for the catch on that detail, Peter. I went ahead and updated so as not to cause any confusion.